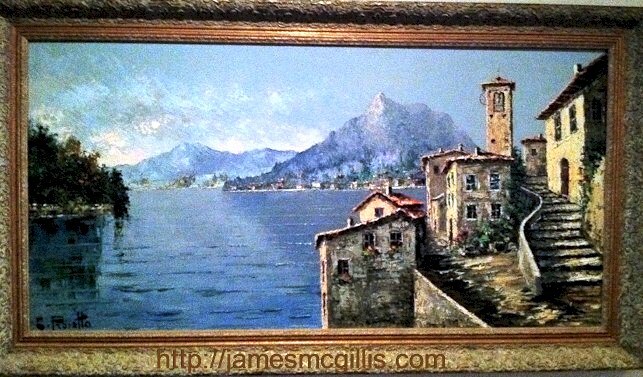 Accompanying a recent email from Julia and Lowel Wise of Huntsville, Alabama were images of their Costantino Proietto original oil painting. While stationed as a service member in Stuttgart, Germany during the 1950’s, Lowel’s parents had purchased the painting. Lowel went on to write, “I was excited to see this on the Internet. We had searched back in 2006, but could not locate the artist by name”. We live in Huntsville, Alabama. The Space & Rocket Center are located here, along with NASA, at the government military installation Redstone Arsenal. It is there where my father was last stationed, and then retired here. The painting has traveled to many locations with us; from Germany where it's acquisition took place to Ft. Polk, Louisiana (my birth place) and back to Germany, and then back to Ft. Rucker, Alabama, and then to Ft. Wainwright, Alaska for five years, and finally here to Huntsville, Alabama. The painting was purchased on my father’s first tour to Germany, before I was born in 1956 and my older sister’s birth in 1955. She was born in Stuttgart, Germany where my father served two tours in the Army. My father (David J. Wise) served in the Korean War and then the Vietnam Conflict/War where he was an Explosive Ordinance Disposal instructor. After returning from Vietnam at the end of 1972, he retired. My father and mother (Gwinda A. Wise) are deceased. We acquired the painting after my mother’s departure in 2001, and my father’s passing was in 1988. Since I was a child, the painting has been of particular interest to me. Sometimes, I would sit and stare at it and then wonder… What it would have been like to live in that location and what life would have been like there… Just a simple way of dreaming as any child would do. My father and mother would tell all four of their siblings how they struggled to save and buy one of C. Proietto's paintings while he was on his first tour to Germany. Again THANKS for the information. In 2006, little if any information about the artist Costantino Proietto (1910–1979) existed on the internet. Not until 2011, when I began writing a series of eleven articles and founded a website about the artist did C.Proietto become widely known. I also met Mr. Nunzio LoCastro, first cousin to the artist, now living in New Jersey. 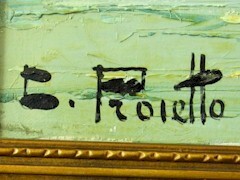 With Nunzio’s help, I compiled an accurate biography of the artist, now published on AskART.com. Since then, several owners of C. Proietto original oil paintings have sent images to me. Via internet searches, I discovered other examples of the artist’s work for sale in Europe and the United States. Since the Wise family C.Proietto represents the fourth known painting of the same village, I am now publishing images of all four paintings. 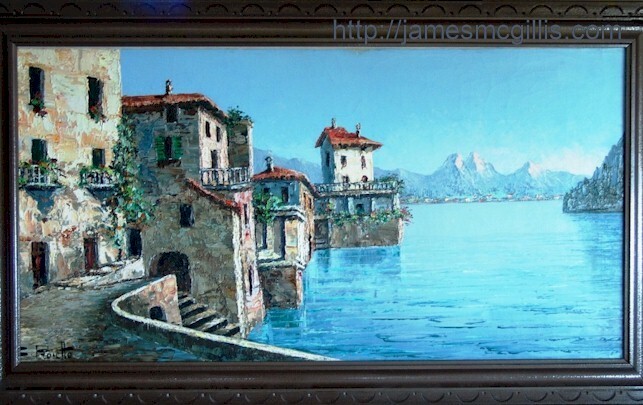 In July 2012, I purchased a Costantino Proietto painting identified only as “Villa di Lago”. 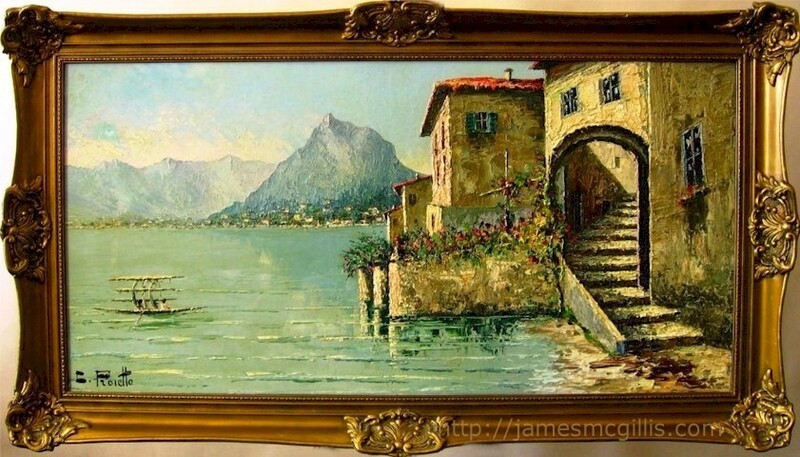 Although my new painting bore strong resemblance to two C.Proietto paintings of “Lago di Lugano Gandria”, which I had found on the internet, I could not be sure. The artist’s Italian and Swiss lake scenes often contain ancient villas, snowcapped mountains and villages on far shores. 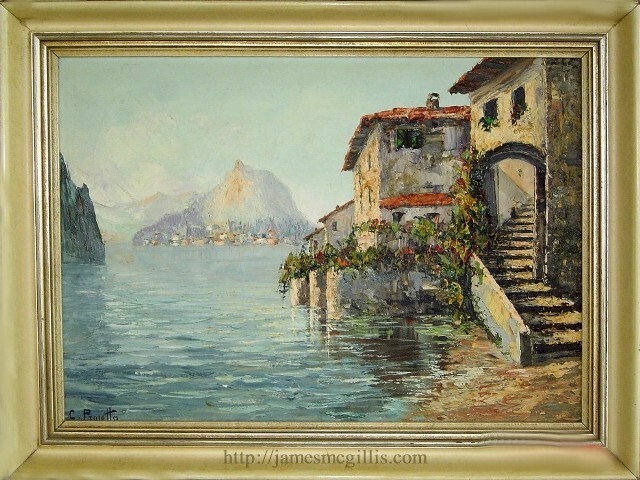 Using the Wise family C.Proietto painting as a guide, I can confirm that both their and my paintings are of Gandria Village, Lake Lugano, Switzerland. By comparing landscape and architectural details with those from the internet images, we now have four confirmed C.Proietto paintings of Gandria Village. The Wise Family C.Proietto displays the 4:3 width-to-height ratios (27" X 18.75") typical of the artist’s early works. Yet, both it and one later example of the artist’s work depict the same stairs and doorway on the right side of the image. 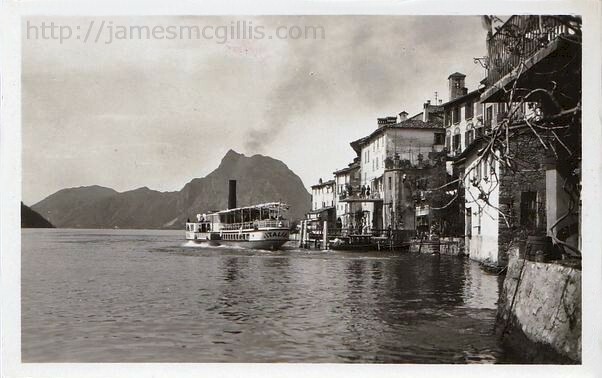 Other old photos show letters above that archway reading, “Ristorante Crivelli, Lago di Lugano-Gandria, Switzerland, 19”. The later C.Proietto painting, probably from the 1960’s, displays a wide-angle format, similar to a Cinemascope movie screen. Even so, because of a near-identical point of view, both paintings likely used the same 1930’s photo as their model. From Nunzio LoCastro we know that the artist painted in his Stuttgart studio, using photographic prints to model his scenes. During the late 1930’s, the artist traveled extensively in northern Italy and Switzerland. During World War II, Costantino Proietto emigrated to his future lifelong home in Stuttgart, Germany. Using his German-made Leica camera, Costantino Proietto documented a soon to be bygone era. Having seen and photographed the major peaks and lakes of Italy and Switzerland, Tino Proietto was later able to depict with accuracy a simpler, more tranquil time and place. Although the simplicity of the artist’s work appears fanciful to some, I have yet to see evidence that Tino Proietto painted from anything other than real life, or his own photography. With its lack of markings on the back, the Wise Family “Lugano Gandria” painting (top) is clearly the oldest of the four paintings pictured here, probably dating to the early 1950’s. In the late 1950’s, the artist affixed paper tags to the backs of his paintings. By then, he would often write the subject matter on the frame, in pencil. Later still, he affixed wax seals to the tags, indicating their authenticity. By the late 1960’s, the artist also wrote descriptive captions on the frames, often using a red felt-tipped pen. With the publication of each new painting, we expand the body of work attributed to twentieth century master impressionist, Costantino Proietto. To keep this expansion going, I invite owners of Costantino Proietto original oil paintings to forward images (front, back, signature and details) to me via email. Please identify purchase location, past and current ownership, plus any details that might help to tell the story. 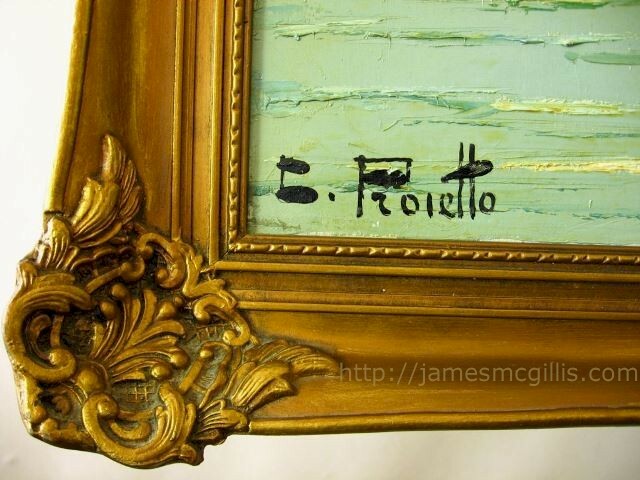 Over time, I will be happy to authenticate and publish images of any newly found C.Proietto impasto oil painting. By THERESA VONPLINSKY on August 17, 2018 11:17 AM | Link to this comment. Hi, my parents bought a similar painting by a different artist, we can not decipher the name on this one very different from yours. It is more impressionist, impasto, and bought in Germany int he mid 1950''s. I have it on my facebook page if you are on facebook you can see it. I have put photos C. Poiretto paintings for reference to compare with my mystery artist painting. Was hoping you had run across the artist, whose signature I have posted in the same thread https://www.facebook.com/photo.php?fbid=10215054329365084&set=p.10215054329365084&type=3&theater.